"The Communication Hall of Space Science and Exploration" (Exhibition Room) is closed on Mondays, and sometimes closed for maintenance. Please check our calendar for the latest information. The main campus of ISAS locates at Sagamihara City. ISAS hosts regular open campus as a part of ISAS's outreach and education program. Admission free. There are free but limited car parking. 10:00 a.m to 5:30 p.m. 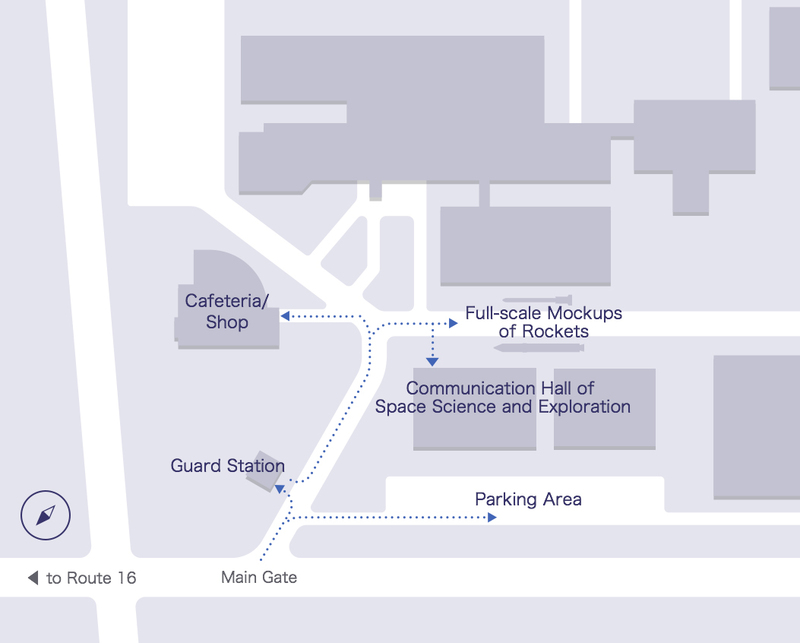 The visitors' area opens 7 days of the week, but "The Communication Hall of Space Science and Exploration" (Exhibition Room) is closed on Mondays. Please check our calendar for the latest information. Self-service vending machines with cold drinks and coffee in the Exhibition Room. You can sit down and take a rest with drinks at the common area in the Exhibition Room. You are also very welcome to use outdoor bench to consume food and drink brought from home. During lunch time, you can use cafeteria. There is a shop of the University of Tokyo CO-OP ISAS that sells souvenir as well as lunch boxes, sandwitches, drinks and refreshments. The shop opens 10:00 a.m. to 4:30 p.m., on business days. Please refrain from entering the areas and facilities that are not opened for public. Assistance dogs (service dog, guide dog, and so on) are allowed in the campus. Please use outdoor bench to eating and drinking. Please take all your garbage back home with you. Thank you for your cooperation. Smoking is prohibited inside the campus except smoking area. Meet full-scale models of M-V and M-3SII Rockets with explanation panels.